OK, you don’t need to be a Michelin trained chef to cook breakfast on a Cadac. I’m not sure that it would help at all and in fact if might even be a hindrance. This was the very first thing we cooked on the Cadac. Yep, it’s the actual photo of the actual thing we cooked. Actually, I’ll own up to it and say that “I” cooked it. Looking at the phot now it quite possibly looks like the saddest, most basic breakfast you could cook, and you probably wouldn’t be wrong if that’s what you thought. But look more closely (if you dare). 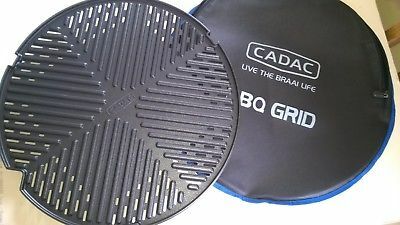 I’m using the Cadac grill 2 braai plate. Why am I using it? Well, it’s flat one side and ribbed the other. 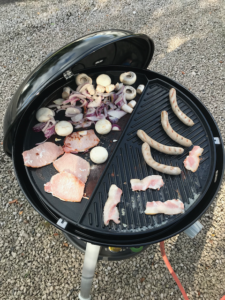 However, for this specific breakfast we’ve separated fatty stuff (sausages and bacon with fat on) and the non-fatty stuff (mushrooms, bacon sans fat, and onions). This means I can enjoy the taste of lard, without it “infecting” Mrs B’s healthier food. Really? Is he really going to tell us how to cook a fried breakfast? Well, no. Just cook it until it’s ready. One thing I would say though, when it comes to sausages, or anything with large amounts of stored fat. 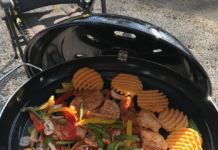 I tend not to use the BBQ Grid as I think it’s called. As you’ll see below it has holes in for the fat to drain, which of course is great. However, with my first Cadac I was cooking looks of fatty foods and I didn’t realise the reservoir beneath where the fat drain into was getting full. Eventually the whole lot burst into flames and that was the end of that Cadac. This gas controls melted and is was only due to quick thinking by disconnecting the gas bottle and moving it that a disaster was averted! So, be careful. It’s been suggested by some that you put a little water in this area where the fat drips, I don’t know if it would help or not, not something I’ve done. Best to just keep an eye on the thing as you cook.